Lis knew she was dreaming, although this brought little comfort as the blood ran over her face. It rushed up her nostrils and caught in the back of her throat. The metallic taste choked her, panic creeping in. 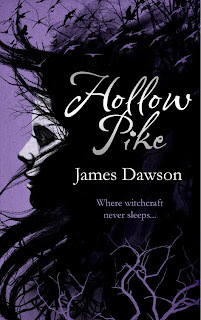 Since I first spoke to James Dawson on Twitter last summer, I have been desperate to get my hands on his debut novel, Hollow Pike. I was beginning to think that it would never arrive. For me, this is definitely one of my most anticipated books for the year and it did not disappoint me. The opening lines saw me hold my breath and I didn't breathe again until the end of the first chapter. I honestly thought I might need medical assistance. What an amazing opening to a book. The intensity of the situation hits you like a fist and knocks you over. Luckily after that it slows to a steady pace, or I may have had to sue for causing damage to my health. The book is full to the brim with a chilling atmosphere, that begins to leave you with the impression that someone might just be watching you. I found it to be completely believable and I am now a little wary of forests, especially as I live right near one that is well known for its connection to witch craft. The book is told from the point of view of Lis, who has moved to Hollow Pike for a new start. Desperate to get away from the uncomfortable situations she found herself in at her previous school, only to dive head first into similar dangerous waters at Hollow Pike. I really felt for Lis, as I was convinced that everyone was out to get her. I couldn't work out who she should actually trust - they all seemed full of devious intentions. I love the touches of sarcasm from Liz; being a really sarcastic person myself, I completely warmed to her straight away. I am impressed by the author's ability to write from a female perspective, something I have always believed to be a hard task for a male author. Danny made a fabulous drool worthy hottie in the book, his hidden geekiness made him even more adorable. I fell in love with Sarah's house. It sounded just like a German Huf Haus, which you buy in kit form. I just wanted to live there. Who doesn't dream of a balcony in their bedroom? The steady pace of the book begins to pick up as the book draws to a close, creating a dangerous situation for Lis at the end. I would never have guessed it would end the way it did and I was left longing for more. I have so many unanswered questions, so I really do hope there is a sequel. James promised a book with a Twin Peaks feel and that is actually what he has given us. I was definitely impressed by this book. Not only was it extremely well plotted, but I also found the writing to be excellent. You can tell the author understood his characters and got into their heads to tell the story. There wasn't a lot of background information concerning all the secondary characters, which I felt added to the tension and suspense of the book, because you had no idea what secrets they had hidden away and whether they were trust worthy or not. This was a brilliant debut for an author I think we will be hearing a lot more about in the future. James Dawson is definitely a debut to watch out for. Nice review! I'll also be keeping my eye out for this one. I've just read & reviewed this book too, and I loved it. I can't wait for it to come out so I can buy copies for my friends! Kristina - definitely worth a read! Jo - I hope you like it. Ailsa- it always makes me feel better when someone is in agreement. Jesse - it is so good! Roro - hope you get to read it soon. Jenni - Can't wait to see what James writes next.